Random Lengths International - Fastmarkets RISI - Objective Insight. Better Decisions. Random Lengths International is a report on global markets for wood products, with prices and market summaries for North American lumber and panel items sold in international markets and purchased by North American importers. Port Authority articles have a worldwide focus, keeping you current with events affecting international trade. World markets provides insight into current trading, and puts the market into perspective for you. In-depth reports are included on specific world markets for clear lumber, merchantable lumber, and panel products, including OSB. Now includes market reports on U.S. imports of European Spruce boards, Brazilian plywood, and OSB from Europe. Global statistics helps you track wood products movements around the globe with detailed import/export statistics from a variety of countries, including New Zealand, Japan, Australia, Sweden, Finland, Germany, Spain, Italy, France, and others. Monthly statistics section features two full pages of lumber, log, and plywood exports from the U.S. and Canada. Price guide reports prices of U.S. and Canadian softwood lumber, plywood, and OSB on their most widely traded basis (f.o.b. dock, c.i.f, or c.&f. ), to both exporters and importers. Every price listed is in both cubic meters and board feet/square feet. 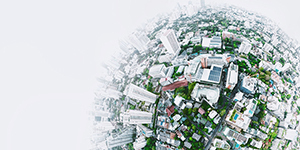 Market watch pinpoints housing starts, export and import statistics, and other data on major players in world markets. Trade talk tells you who’s doing what in the trade. 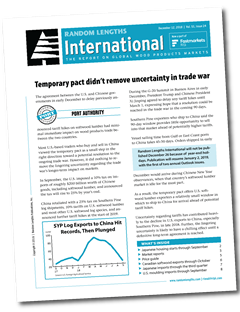 World watch is a concise and readable report recaps market conditions around the world, from supply regions such as Brazil, Chile, New Zealand, and Scandinavia, to consuming markets, including Asia, Europe, and the Middle East. Key price trends tracked by U.S. importers, including Radiata Pine shop, Pine fingerjoint blocks and blanks, and Western S-P-F dimension and studs. Exchange rate table shows the trends in 16 currencies in U.S. dollars and vice versa.